After a wildly successful opening night, the NYC Horror Film Festival continued slashing away last night, from the Cinepolis Chelsea in the heart of Manhattan. I took in two more feature horror films, as well as five more incredible shorts. 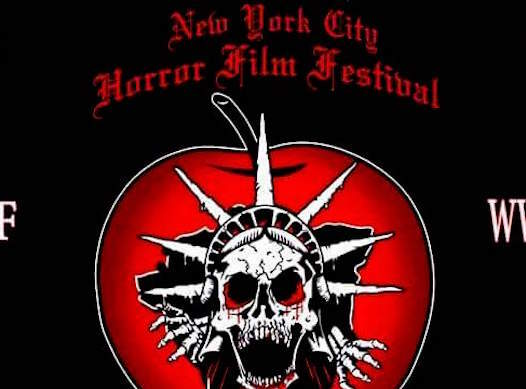 The festival, started by the late Michael J. Hein, is the longest-running horror festival in New York, in its incredible 14th year, and it’s continuing throughout the weekend. Screenings started at noon today, with the highlight being the Lifetime Achievement Award presentation to classic scream queen, Adrienne Barbeau (Creepshow, The Fog). Tomorrow, will bring another set of films followed by the NYCHFF Awards Ceremony. Before each screening, as per tradition, the festival hosts Sean Marks, Chris Rowan, and Alan Rowe Kelly host a trivia giveaway (I won some swag), before Rowan leads the crowd in the NYCHFF mantra, “Let the bodies… hit the floor!” There was a trio of amazing short films before the first feature film I saw last night. Chris McInroy’s 5-minute short Death Metal had the crowd roaring; it’s the simple story of a father who passes an evil guitar to his loser son, who promptly ignores all the rules and chaos ensues. Next up was Quenottes (Pearlies), by French duo Pascal Thibeaux & Gil Pinheiro, which told an interesting and different take on the Tooth Fairy story. In this film, the tooth fairy is a mouse, who will stop at nothing to get its teeth. Finally, there was Scott Woodburn’s It’s a Boy, which had home field advantage as the cast and crew were in the crowd. The film starts mellow, a couple taking fertility vitamins to get pregnant, when the husband begins having adverse reactions, leading to a… well, shocking conclusion. The midnight showing was Parasites by Chad Ferrin, an urban horror film about a gang of psychotic homeless murderers, and featuring a performance by Day of the Dead’s Joseph Pilato. The shorts before it, again were fantastic, especially Cotton, written and directed by Casey Rose Daniel about a woman who finds out too late what most others suspected – her boyfriend is a psychotic murderer. Also featured was The Rat King by Pavel Shepan, dealing with an evil presence in the home of a couple dealing with their own issues. The NYCHFF continues with over a dozen more films the next two days as well as Adrienne Barbeau live tonight and the Awards Ceremony Sunday. The Cinepolis Chelsea is located 260 West 23rd Street in Manhattan and you can buy tickets and check out the film schedule at the NYCHFF website, nychorrorfest.com.